I am so in love with this book! Thank you so much for a chance to win a signed copy! The second I saw it was inspired by Persuasion I knew I had to read it. It's my Fav Austen as well! Haha, I'd definitely love to win a signed copy! This is already one of my favorite books. And "seethes with romantic tension" is a perfect description. Confession time: I've never actually read Persuasion (or any Jane Austen). 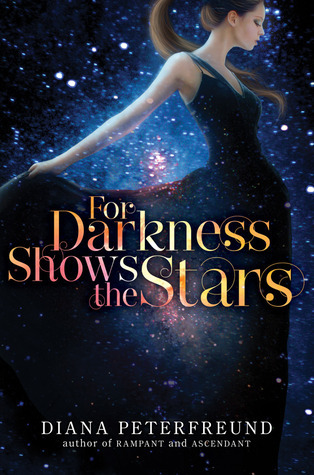 Still, I am super excited to read For Darkness Shows the Stars and I'm glad to hear the characters and world-building are engaging. This review just made me more anxious to start reading! Holy crap!! This sounds so awesome. Thanks for hosting a great contest! I can't wait to read this book! That cover is gorgeous! Chey & Sarabara082: You are very welcome! Melissa: I know exactly how you feel! thekams: You don't need to have read Persuasion at all - in fact, I think you'll love it all the same without any knowledge of the Austen original. It's just... SO GOOD. Becky: It is. THAT good, I mean. Find a copy even if you don't win - it's worth it! You always find books with such amazing covers! It "seethes with romantic tension"? Oh my goodness, I have to read this. I really LOVED For Darkness Shows The Stars but have not yet read Persuasion or Academy 7 and will have to give both a shot, as you recommend them. I like what you said about how Elliot isn't angelic but just doing the best with what she's been given. I absolutely agree with that assessment. I cant wait to read this book I am also a huge fan of Persuasion so when I heard this book was based on it I knew I had to read it!!! !